We’re all told that cycling is growing in most Irish cities, but that growth has taken place after some sharp declines. Guest writer Peter Barry takes a look at the modal share of cycling as transport in Irish cities between 1991-2011, and beyond. 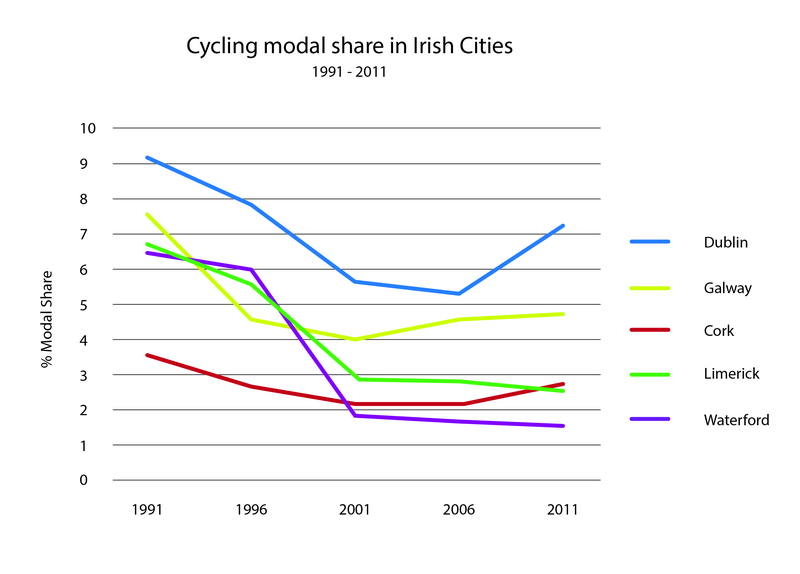 This is a graph indicating the modal share of cycling in the five main Irish cities between 1991 and 2011, based on data from the five-yearly Irish census. The share of people cycling to work, school, or college halved between 1991 and 2001. Between 2001 and 2011 cycling more or less flatlined, with a slight pick up at the latter end of the decade. Cycling levels in Limerick and Waterford have fallen continually since 1991. In fact, cycling levels are likely to have been continually falling since the middle of the twentieth century. The collapse was particularly dramatic in Waterford between 1996 and 2001, where there was a 68% decline. decline in the amount of people cycling to work or education. This saw Waterford going from having the second-highest level of cycling in the state to the lowest. Only Galway has managed to record growth for two consecutive census periods. Cycling levels rose dramatically in Dublin between 2006 and 2011. Part of this increase may be due to the introduction of the dublinbikes scheme, which did much to popularise and normalise cycling as a mode of transport. It will be interesting to see if a corresponding effect may be seen in Cork, Limerick and Galway in 2016 following the introduction of bike sharing in those cities. Since 1986 the census has recorded how people get to work school, or college, though unfortunately, 1991 is the first year for which I have information for all Irish cities. Though I haven’t been able to source the 1986 data for the whole of Ireland, I do know that the 1986 modal share for Cork stood at 8%. 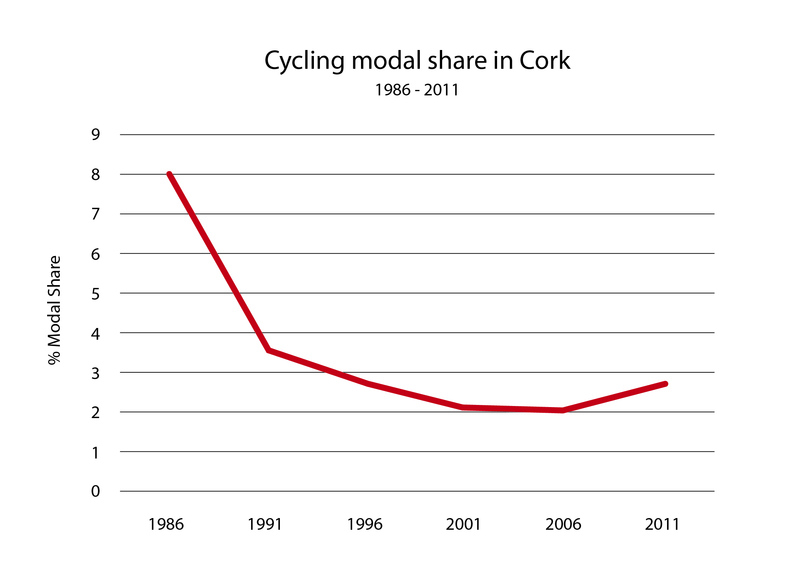 Assuming that in 1986 the other cities had similar or higher modal shares, then in the mid-1980s the modal share for cycling in Irish cities would have averaged 8-9% or higher. By 2006 this had fallen to an average of 3.3%, rising in 2011 to 3.8%. The data from the 2011 census is examined in more detail on IrishCycle.com in a post in 2012. The next census is due to occur in 2016, and cycle campaigners eagerly await its findings. The strong growth recorded in Dublin between 2006 and 2011 looks set to continue – canal cordon counts have shown that the number of cyclists crossing the canals has grown by 10-15% each year since 2010. Anecdotally, cycling is increasing in popularity in both Cork and Limerick, and this is likely to be enhanced by the presence of the bikeshare system. Likewise, it is reasonable to expect cycling levels to grow in Galway, which also has the bikeshare system. The situation for Waterford is more uncertain. Provision for cycling is quite poor, and the city missed out on being included in the bikeshare scheme due to a low potential uptake. Overall, the average modal share across the five cities is likely to grow, but most of this is likely to be due to growth in Dublin. The census measures the mode of primary mode of transport for those going to work, school or college. It is worth noting that this only measures a certain proportion of cycle trips – it ignores things like trips to the shop, leisure rides, and other non-commuting trips, and as such only gives a partial impression of cycling levels. Gauging the modal share of cycling is a tricky thing and stats should be taken with a pinch of salt. Also, how this data is classified varies from year to year, making the data somewhat suspect – see the Appendix. Thus the dramatic fall in cycling levels between 1996 and 2001 may be due in part to the fact that the census moved from recording the mode of travel of those 15 years and over, to those of 5 years and older. Pre-teens are less likely to cycle, and that may have given the impression of a greater decline than actually happened. 2006: Persons aged 5 years and over by means of travel to work school or college. 2001: Persons aged 5 years and over by means of travel to work school or college. The Census could be done better , there is a huge Tranche of People not working or going to School or College. People who Travel to various places by Bike and do not go near the Canal Cordon. Those who travel into the Cities for various reasons like shopping or leisure. They could ask people do you use your Bike every day of the week for leisure commuting Shops Cinema etc. Definitely, census data is the best metric of the popularity of cycling in Ireland, and it’s a fairly limited sort of data. The Canal Cordon Count is excellent, but again, it only measures commuting traffic into Dublin on a November morning. Cork city also has an annual traffic count, but it doesn’t make it public. There’s also the issue of access to data – this census data was a tedious chore to excavate from scans of printed documents on the CSO website. Perhaps when the government implements their OpenData strategy we’ll have better access to data on cycling, but I’m not sure the base data there is detailed enough to build up a proper picture of the levels of cycling in Ireland. There’s a real need for a yearly cycle survey to be undertaken on a yearly basis. The DfT in the UK have a yearly Active People Survey, which measures the rates of walking and cycling in each Local Authority – this gives a very good picture of cycling levels. I don’t know if the NTA have a similar survey, but they really should. Thanks for the great article. Does the data break down cycle modal share by gender? Glancing at the link below had me wondering could changes in usage by gender offer any insight into the implications of that reclassification from 2001 onwards. I had quick look at my old spread sheets – the numbers I have indicate that national figures for cycling to work grew considerably between 1981 and 1986. So in 1981 the national share for cycling to work was 4.16% (46994/1130344) this grew to 5.61% (60750/1083647) in 1986. Note that the population travelling to work fell by about 4% so we may be seeing the effect of economic factors. Interestingly cycling participation was higher among female workers. So male cycling went from 3.98% to 5.36%. Among female workers it went from 4.58% to 6.13%. In actual numbers the number of females cycling to work went from 14965 to 21281 an increase of 42% – however there was also a smaller increase in the number of females travelling to work (6.29%). The decline in people travelling work was concentrated among males whose numbers dropped by a bit over 8%. What I think is interesting about this growth in cycling numbers is that this would have happened in a general absence of any programs of cycling infrastructure, cycle lanes etc.